A dynamite portrait of a man on the verge of total psychological and moral collapse, Robert Aldrich's 1955 indictment of Hollywood stars Jack Palance, Ida Lupino, and Rod Steiger. Adapted from a series of plays by Clifford Odets, Aldrich's film focuses on the ways in which a man's freedom is systematically denied him by the forces that control his world, whether that world is the arts, business, or politics. Palance is superb as the Hollywood star who now has to be blackmailed to continue starring in the dreadful films produced by Rod Steiger (in a magnificent portrayal of Harry Cohn, Louis B. Mayer, and Jack Warner rolled into one). Electric, exciting, and ultimately very depressing. 111 min. 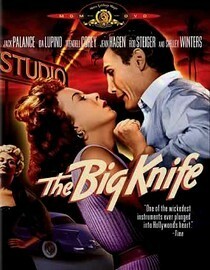 The Big Knife is not showing in any theaters in the area.